When office managers, building owners, and furniture dealers need used Allsteel cubicles that look like new, many rely on the exceptional selection at Panel Systems Unlimited. Used cubicles are our specialty, and we pride ourselves on offering used Allsteel workstations of unbeatable durability and appearance. We only choose workstations that meet our high standards of quality for our inventory, and those that meet our strict requirements are then steam cleaned and retouched by our skilled office furniture technicians with more than 40 years of combined experience. From the cost-effective Concensys line to the graceful design of Stride, whatever Allsteel cubicles you need can be found right here. And when you buy used office furniture from Panel Systems Unlimited, you also get the added value of space planning services by design and installation professionals. Our team utilizes CAD technology to create detailed floor plans of your unique workplace which configure your new furnishings in a way that improves the efficiency and productivity of your office. We also take care of the entire assembly process for your workstations. We can even remove your old furnishings for liquidation. Contact Panel Systems Unlimited today for information on used Allsteel cubicles for Tallahassee, New Orleans, Jacksonville, Savannah, Durham or anywhere nationwide. 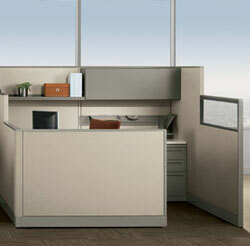 We also carry remanufactured cubicles, workstations, and modular office furniture from Kimball, Trendway, Herman Miller, and many more top brands.